This post has 3,287 views. I’m mostly writing about my travels these days. As a grad student, I don’t have the time nor money to travel a lot, but if I still try to go somewhere once in a while. 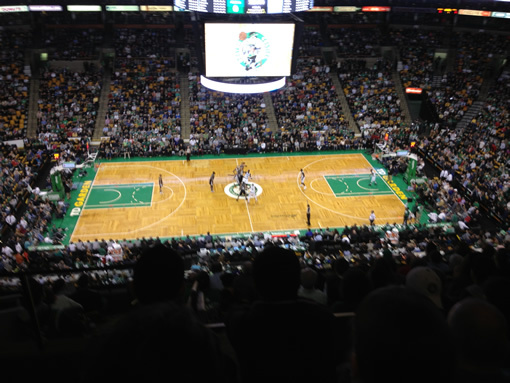 During Thanksgiving break, a couple of friends and I went to Boston on an one day trip to catch a NBA basketball game. It was my first time seeing a NBA game in person, and it was a fun experience. We also explored downtown Boston by following the Freedom Trail. Here is a short summary along with some photos of the trip. 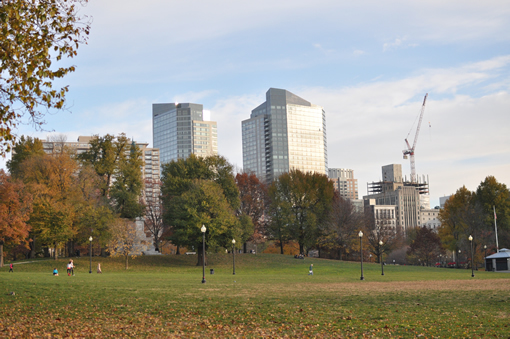 A view from the Boston Commons towards… some part of Boston. 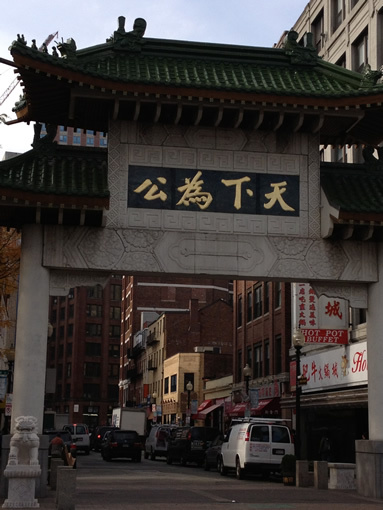 Wouldn’t be a visit to Chinatown if we didn’t take a picture of the gate. We arrived in Boston at around noon time. Boston supposedly has a reputation for bad traffic, so we didn’t want to drive in the downtown area too much so we just parked our car at the Boston Commons garage and set out on foot. The Boston downtown area is actually quite compact, and there is also a decent subway system so going out for a walk was certainly feasible. Before we did anything touristy stuff, first we had to find some lunch. Being Chinese, we automatically went into Chinatown. Boston’s Chinatown is a of a decent size. It’s not as big as the one in New York City, but it felt a little bigger than the one in Montreal. There were plenty of people, probably because most schools are having Thanksgiving break and the students are out and about. We went into the first place that we didn’t have to wait for a seat. The food was decent, and the portions were pretty big so we were all full. 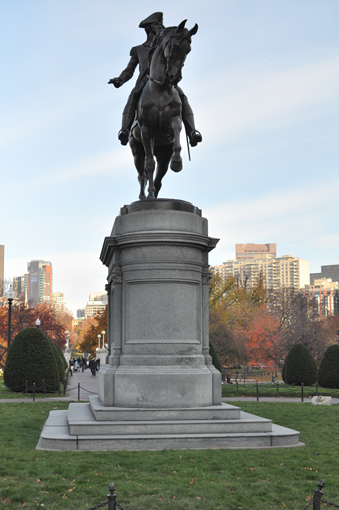 George Washington looking mighty at the western entrance of the Boston Public Garden. To walk off all of the stuff we ate, we went back to Boston Commons and the Public Garden, two adjacent parks within walking distance of the city center. Both parks were pretty nice with trees and various monuments, and the Public Garden had a small lake and some interesting statutes. Among the other little things we notices, We saw that the squirrels in the park were really fat and are not afraid of people. 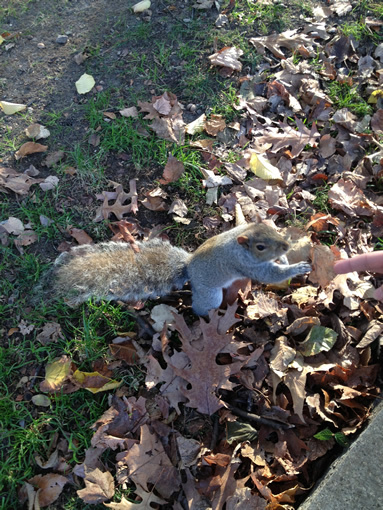 I guess people at the park really love feeding the squirrels. One of my friends actually lured one in with a leaf as shown in the picture below. One of my friends actually lured in a chubby squirrel. The squirrel promptly left after finding out my friend didn’t have any food to offer. 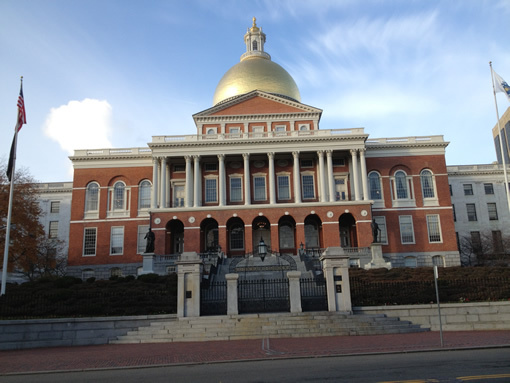 The Mass State House, one of the first notable places along the Freedom Trail. Following the Freedom Trail markings on the sidewalks. After walking around in the park, we started our journey down the Freedom Trail. 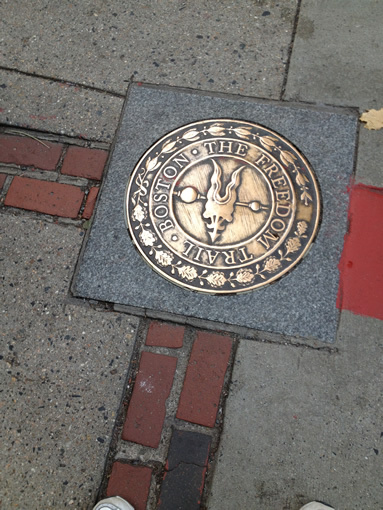 Marked by a line or red bricks or paint, the Freedom Trail starts at the Boston Commons and winds through downtown Boston past various historic building and places. Along the way, there was the Massachusetts State House, the Old City Hall, Quincy Market, churches, and other interesting places. We didn’t really stop too long at any single attraction, but the Freedom Trail was a good way to explore Boston’s Downtown area. The Freedom Trail eventually leads across a bridge into Charlestown where the trail ends at the Bunker Hill Monument. The monument is an obelisk like the Washington Monument in D.C., but it’s a little smaller. We got there too late to go up the monument, so we just looked around the surrounding area for a bit. 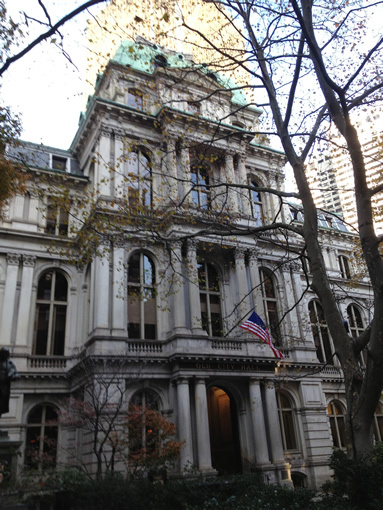 The old city hall, one of the many interesting places along the Freedom Trail. 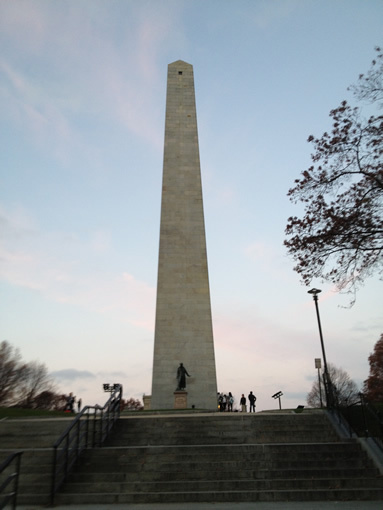 Bunker Hill Monument, the last stop of the Freedom Trail. It was getting dark and since we had a NBA to go to at night, we decided to have dinner a little early. We walked to the nearest subway station and took the train right back into Chinatown. If I was by myself, I might have gone and ate some other type of food, but given the group Chinatown is probably the safest bet. Because of the big lunch we had, none of us were particularly hungry, so we didn’t eat much. Since we were in Boston, we did order a lobster dish, but it was one lobster shared among five people. Tip-off time at the TD Garden. The view from the balcony was decent. After dinner, we took the subway to Boston Celtics’ arena, the TD Garden to watch the game against the San Antonio Spurs. We went a little early, but people were starting to arrive. We have the balcony seats, but we went down to the floor level to look around first. There was one third-stringer from each team shooting, and that was it. We probably went way too late to see the actual practice. We went to our seats soon afterwards. The balcony seats were obviously not close to the court, but we were in the middle section, and the view was alright. I could make out who was who on the court. The downsides to the balcony seats were that we had no chance at any of the free t-shirts and other stuff being tossed into the crowd. The row in front of mine did each win a scratch-and-win lottery ticket, and two of the guys in our group were in that row. I don’t think either of them got winning lottery tickets though. As for the game itself, the Celtics and Spurs are both good teams. It was high-scoring game and remained close, and at the end the Spurs held on and won 112-100. Between the Celtics and the Spurs, I prefer the Spurs so I was happy. My first live NBA game was a pretty good experience. If nothing else, watching NBA was certainly a less expensive proposition than watching NFL football, especially the Giants. Walking around in Boston downtown was also a nice experience. My impressions of the city are pretty positive from my two visits. The downtown area is compact and relatively clean, and it certainly has character. I’m sure I’ll visit Boston again before my graduate studies are done.